Last night (Sat., Jan. 2, 2016), Diego Brandao and Brian Ortega went to war at UFC 195 inside MGM Grand Garden Arena in Las Vegas, Nevada. In a competitive scrap, Ortega came out on top. Find out how below! Ultimate Fighting Championship (UFC) Featherweight finishers Diego Brandao and Brian Ortega collided last night (Jan. 2, 2016) at UFC 195 inside MGM Grand Garden Arena in Las Vegas, Nevada. Brandao may not have found consistent success just yet, but he’s consistently violent at least. The Brazilian brought his usual do-or-die attack into the cage last night, as he was looking to blow through his opponent. Meanwhile, Ortega was looking to prove himself as a true contender. He looked the part of a blue-chip prospect in his last bout against a tough opponent, and another strong performance would really push him up the ladder. To watch Brian Ortega vs. Diego Brandao full fight video highlights from UFC 195 last night click here. Brandao, as expected, wasted little timing in taking the fight to his opponent. He was the more physical fighter and better striker, allowing him to work over his opponent early. 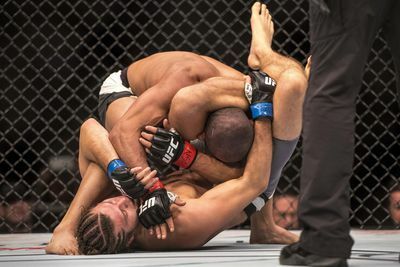 In particular, Brandao was doing big damage with low kicks and landed some takedowns as well. Ortega fared far better in the second half of the round. He was still getting hit hard, but Brandao’s shots were losing some steam, whereas Ortega was beginning to connect and throwing with good volume. It wasn’t enough to win back the round, but it was a start. Brandao started the second round well enough, but he was definitely getting slower. However, Ortega didn’t really capitalize early on, circling away from most exchanges without throwing much of anything.